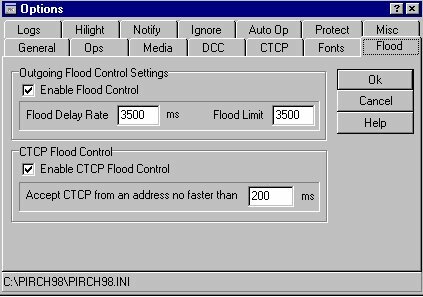 General | Ops | Media | DCC | CTCP | Fonts | Flood | Logs | Hilight | Notify | Ignore | Auto Op | Protect | Misc. Click on the Prefs tab at the top of your PIRCH window and then click on the tab that says "General". this will show all notices on the window that you have active at the moment. "Private Messages/Notices" select "Minimize New Message Windows" and "Suppress Message Interrupts", this will stop interruptions of your general chat by the private messages. The Server Connection Timeout in the "Connections" section should be set at 1. Check the box that says "Auto reconnect on disconnect". Rember to always click on OK to save your changes in prefs. Click on prefs at the top of your PIRCH window and then click on the tab that says "Ops". These can always be changed to your personal preference. Remember to click on OK to save any changes you have made in prefs. In the window that says "Default Sound Path" type in the file path that points to where your sound files are. In most cases this will be c:\pirch98\sounds . 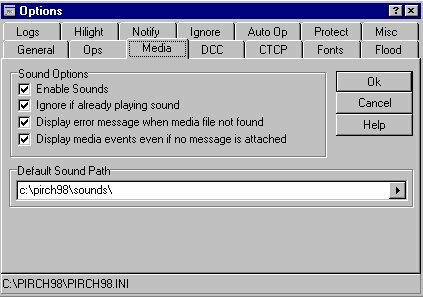 NOTE: if you do not have a folder for sounds you can either take off the \sounds part of the path or create a sounds folder using windows explorer. Click on prefs at the top of your PIRCH window and then click on the tab that says "DCC". Where it says Packet size change from whatever to 1024. Both windows in Timeouts should have 30 in them. NOTE: it is recommendd that you DO NOT check the box that says auto accept chat or auto accept DCC send. this is for security/risk reasons. Click on OK to save any changes you have made in prefs. This will be the same except the download path will be c:\pirch98\downloads. Click on prefs at the top of your PIRCH window and then click on the tab that says "CTCP". This section determines the response that people will get when they do a "Finger" or "User Info" on your nick. Type in whatever you want them to see when they do this. Click on OK to save any changes that you have made in prefs. Click on prefs at the top of your PIRCH window and then on the tab that says "Fonts". This section of prefs is where you choose what font you would like to use and how large you want it to be. To change your font face or size click where it says sample and then choose your font and size. Please note that depending on the font you choose...certain characters may not be seen or may look funny. It is recommended you use a basic font like arial 9 regular. Remeber to click on OK to save any changes you have made in prefs. Click on prefs at the top of your PIRCH window and then click on the tab that says "Flood". Set your "Flood Delay Rate" at 3500ms and "Flood Limit" to 3500. Set "Accept CTCP from an address no faster than 200ms. 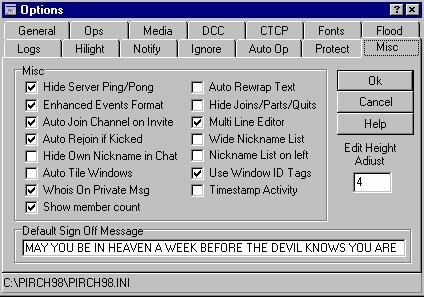 PIRCH98 already comes with this file. Click on prefs at the top of your PIRCH window and then click on the tab that says "Logs". 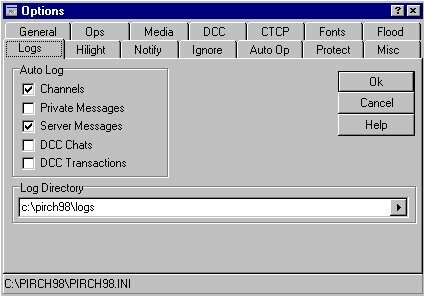 Next put a check in the boxes next to the type of logs you would like to keep (Channel, Private Message, Server, DCC). At the bottom of the prefs window you need to type in your file path for your log folder we had you set up earlier. This option in prefs will allow you to tell pirch to highlight certain words or phrases. (such as your nick or any words that you want highlighted) Click on prefs at the top of your window and go to hilight tab. To add words or phrases to this list click on add and then type in the word or phrase you want to add, then hit ok. Repeat this step for all the words or phrases you want to add. To remove a word from this list click on the word and then click on "Remove". You can also set this option up to highlight your own messages or to beep on Highlighted messages. If you would like to do this, check the appropriate box(es) at the bottom. 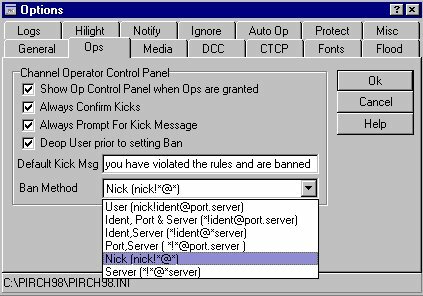 NOTE: many of you have come into #Pirch and #30+toybox and asked how to turn this off...just uncheck the Beep on highlighted messages. 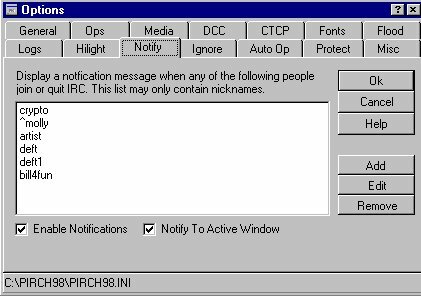 This option in PIRCH will allow you to set up a list of people that you would like to be notified whenever they come on or leave IRC. Click on prefs at the top of your pIRCh window and then click on the tab that says "Notify". To add people to your list, click on add and type in the name of the person you want to be notified of, then click OK. Repeat this step for all the people you want to add to your list. To remove people highlight the name and click remove. which shows in the server window togetin has been added to notify. Check both boxes at the bottom of the window. This option allows you to "ignore" any person added to this list. When you add a person to this list you will not be able to see ANY posts from this person...please be careful when using this. Click on prefs at the top of your pIRCh window and then click on the tab that says "Ignore". To add someone to this list click on add and then type in the name of the person you would like to ignore. Click on OK. Repeat these steps for all the people you would like to add to this list. To remove someone from your list click on their name and then click on "Remove". This option will let you set up PIRCH to automatically op(/mode # +o NickName) certain people when they join a room that you have ops in. Click on prefs at the top of your PIRCH window and then click on the tab that says "Auto Op". To add someone to this list click on add and put in the address of the person you want to auto op (Do not use NickNames here). Then click on OK. If you right click in the nickname list and go to USER you can also add the person in auto op that way...be VERY careful in doing this Room takeovers are very common and can be avoided by only granting ops to people you can trust. To remove someone from this list click on their address and then click "Remove". 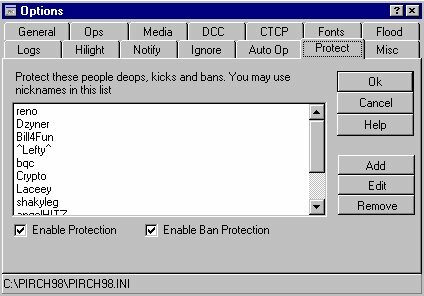 This option in PIRCH allows you to "protect" anyone added to this list from deops, kicks, and bans. Click on prefs at the top of your PIRCH window and then click on the tab that says "Protect". Put a check in both boxes at the bottom. To remove someone from this list click once on their name and then click on "Remove". There are lots of different things you can try here. This is a section that is basically up to you. My advice is to play with these a bit and find a combo that you like and keep them. Click on prefs at the top of your PIRCH window and then click on the tab that says "Misc."